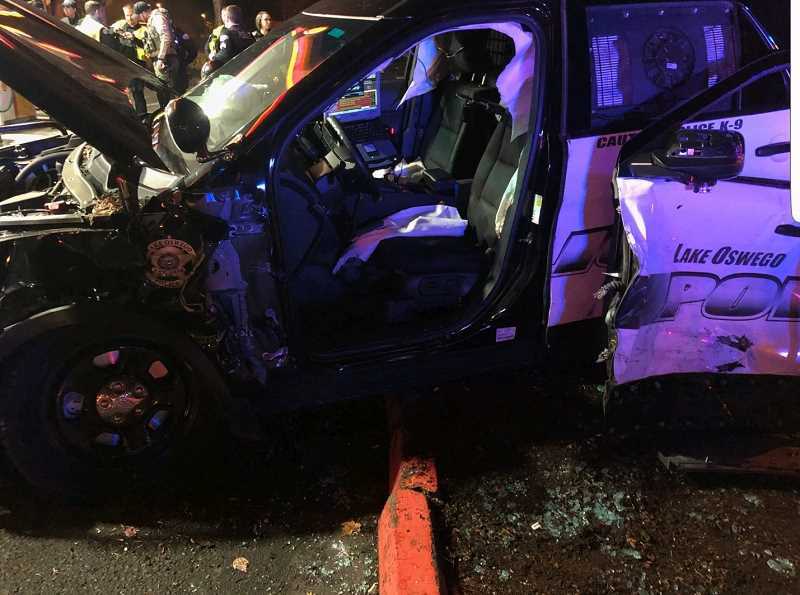 Lake Oswego Police Officer Erich Mayr suffered minor injuries Thursday evening when his patrol car was struck by an SUV at Boones Ferry and Bryant roads. K9 officer Szemi, who was in the car with Mayr, was not injured. According to LOPD Lt. Darryl Wrisley, Mayr was headed south on Boones Ferry at around 7:15 p.m. when the light at Bryant turned green. As Mayr's car entered the intersection, Wrisley said, it was T-boned by a 2018 Subaru Forester driven by 51-year-old Michael Reynolds of Lake Oswego. Mayr was initially trapped in his car and had to be extricated by first responders, Wrisley said. He was taken by ambulance to Oregon Health & Science University with minor injuries and then released shortly after 11 p.m.
"He's just really, really sore," Wrisley said. Mayr's wife Susan and several members of the LOPD accompanied the officer to OHSU, Wrisley said. Officer Bryan McMahon, the LOPD's other dog handler, took Szemi to a veterinarian for examination and then home. Reynolds, who did not appear to be injured, remained at the scene and cooperated with officers, Wrisley said. No charges were filed or citations issued Thursday night, but Wrisley said the crash remains under investigation by the Clackamas County Sheriff's Office.